Ionisation of weak acids / bases(and the effects on their ability to cross membranes). Ionisation of a drug markedly reduces its lipid permeability therefore reduces its ability to penetrate membranes. Irreversible antagonist – EC 50 is same but E max is reduced. (Partial agonists also have this relationship). Agonist – a molecule that binds to a receptor and activates it in some way to bring about an action either directly or indirectly. Antagonist – a molecule that binds to a receptor an inhibits its action in some way. Potency – amount of effect for a given concentration – reflected by EC50. ED50 or EC50 – concentration required to reach 50% of maximal effect. TD50 – median toxic dose – dose required to produce a particular toxic effect in 50% of animals. LD50 – median lethal dose – dose required to produce a death in 50% of animals. Volume of distribution (Vd) – the apparent space in the body required to contain the drug if the drug is to be spread homogeneously at the concentration found in blood. Vd = drug amount/blood concentration of the drug. Clearance = rate of elimination/plasma concentration. Elimination – capacity-limited vs. flow-dependent. First order elimination – when the elimination is not saturable, the rate of elimination is proportional to concentration. The more you give the more is cleared. 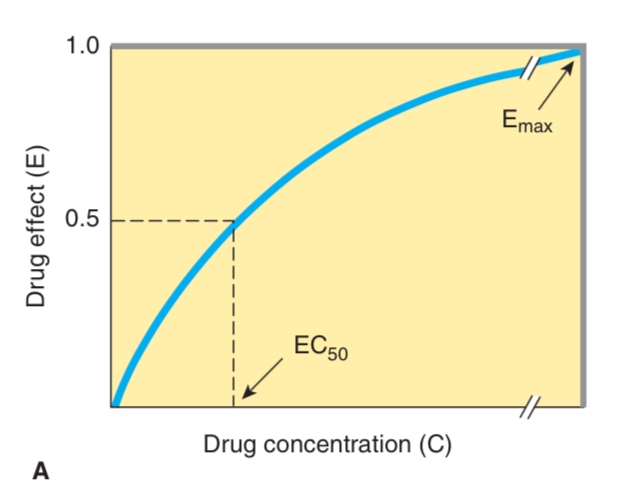 Zero order kinetics – the rate of elimination is constant regardless of concentration of the drug. Rate of elimination = (Vmax x C)/(Km + C) Vmax = max elimination capacity, Km = drug concentration at which rate of elimination is 50% of max. Eg ethOH, phenytoin, asprin – if dose rate surpasses elimination capacity – concentration will keep increasing as long as you keep dosing. The drugs are cleared so well most of the drug is eliminated on first pass through the organ. Elimination of these drugs depend on the rate of drug delivery to the organ. Bioavailability – percentage of unchanged drug reaching systemic circulation following administration by any route. Affected by absorption and first pass metabolism. Systemic clearance is not affected by bioavailability. Phase 1 & phase 2 reactions. Draw a dose/response (or log dose/response) curve. 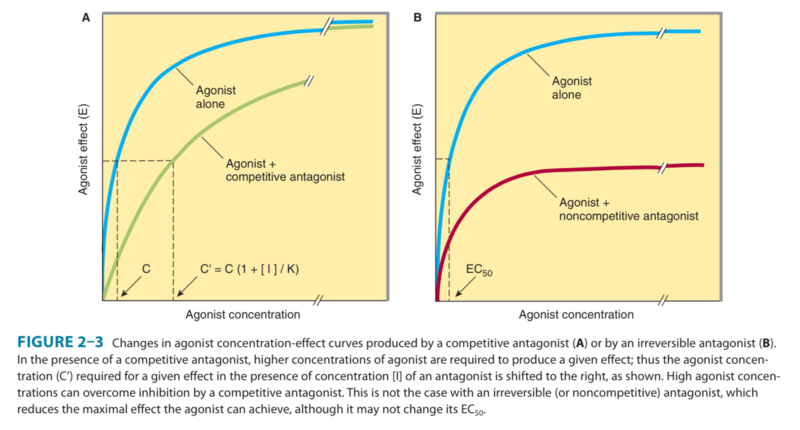 Draw the curve after addition of a competitive antagonist / irreversible antagonist / partial agonist. How may drug receptors cause a response ? How do you calculate Loading dose ? How do you calculate Maintenance dose ? Different dosing intervals will have same average level but different peak and trough levels. What is steady state ? Receptor occupied by agonist –> conformational change –> steps –> pharmacological response. Spare receptors – when you can achieve maximal biological effect without occupying all the receptors (some receptors are spare). Can be spare in number or temporally be spare. Tachyphylaxis – respoinsiveness diminishes rapidly after administration of a drug.